The 19335 is a factory-installed bulkhead-mounted coaxial cable. The associated enclosure on your order is properly cut to fit the Type N bulkhead connector, and the cable is installed prior to shipment. The cable has a Type N Female bulkhead connector on one end and an RPSMA plug (male) connector on the other. The cable is 17 in. (43.2 cm) of low-loss LMR-195. This cable assembly is generally used with an RF401-series radio, CR206X datalogger, AVW206 spectrum analyzer, or NL240 Wi-Fi interface inside the enclosure and a Type N Male-terminated radio-antenna cable outside the enclosure. To order just the cable, ask for pn 19330. The 19335 allows you to attach an antenna cable to the outside of the enclosure. It is intended for enclosures that will house an RF401-series spread-spectrum radio, RF430-series spread-spectrum radio, CR200(X)-series datalooger, or AVW200-series vibrating-wire interface. When ordered, Campbell Scientific will punch a special bulkhead hole in the enclosure and install a 17" (43.2 cm) cable. The installed cable has a type-RPSMA plug (male) connector on one end and a type-N bulkhead jack (female) connector on the other end. 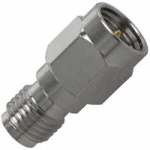 The type-RPSMA male connector attaches to the radio, data logger, or interface. 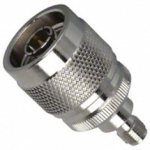 The type-N female connector attaches to the antenna via a COAXNTN-L or a similar type-N male to type-N male cable. The 19335's 17-in. cable connects to a device that has a type-N-to-RPSMA antenna connector.